Image Description: Three queer people stand smiling towards the camera at the 2016 Trans March, Alison is in the center. 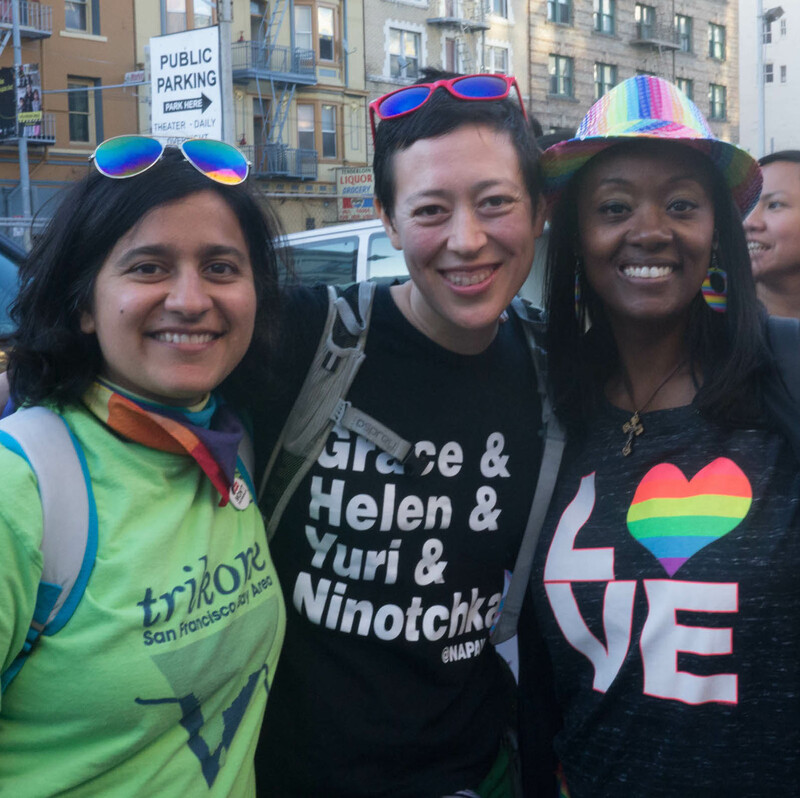 ALISON LIN, a queer, mixed-race (Chinese-American and white) woman, has been an active volunteer with APIENC since she moved to the Bay Area three years ago. Alison currently works with social justice nonprofits, where she focuses on collaboration, embodied leadership, and learning through experimentation. Alison has been involved in queer Asian & Pacific Islander communities since 2004, when she joined QWAVE in New York City. She had been looking for both queer community and API community at the time, and found the intersection of both in QWAVE. Since then, Alison has been interested in belonging to and building queer API communities. Alison deepened her commitment to LGBTQ API communities when she first attended the NQAPIA conference in Seattle in 2010. She recalls particularly enjoying the last day, when she ate lunch outside with the other attendees as they played music and sang together. Alison describes this as feeling like a warm “summer camp community.” She had never heard of NQAPIA before deciding to attend the conference, but it made an instant impact on her life. Many of the people she met in 2010 are still important to her life today, though they live across the country. Alison notes that she came out of the NQAPIA conference “dedicated to creating space for others to come together and take political action.” After returning from the conference to her then-home city of Philadelphia, Alison was inspired both by NQAPIA and by her experiences with QWAVE to co-found hotpot!, a local group for queer and trans API women. Around the same time, she joined the national board of NQAPIA. Alison began her involvement with APIENC by volunteering at Dragon Fruit Project events, where she had the opportunity to interview community leader Crystal Jang about her experiences as a parent. Not long after, she was asked to join the fundraising committee. She had prior experience with fundraising, and also holds a strong belief in the worth of grassroots fundraising. “I really do believe in the value of abundance,” Alison says. “We have to be the ones funding our work.” Alison also hopes to engage APIENC’s wide range of allies in fundraising. In 2016, she has been focusing on individual donations, which is a major source of the funding that allows APIENC’s programs to grow and continue. Fun Fact: Alison loves dancing. This year, she danced in SF Pride with Rhythm and Motion, and she recently took a queer Texas Two Step and country line dancing class. This entry was posted in Blog, frontpage, Volunteer Spotlight by sammie. Bookmark the permalink.